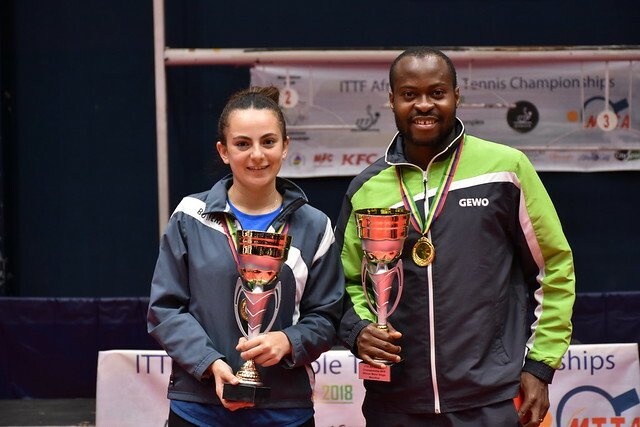 Defeat at the hands of Algeria represented by Katia Kessaci, Sannah Lagsir and Lynda Loghraibi was the end result for South Africa on the afternoon of Wednesday 5th September in the Women’s Team event at the 2018 ITTF-African Championships in Port Louis, Mauritius. Nevertheless for the outfit that over the initial three days of competition had selected from Danisha Patel and Simeen Mookrey alongside Mthabiseng Mtshoelibe and Thabisile Mtshoelibe it was a most creditable performance. Notably Mthabiseng and Thabisile Mtshoelibe are 20 year old twin sisters, both most realistic with regards to their participation in Port Louis. They are present to learn in their efforts that one day they will achieve their goals of being the leading players in the Rainbow nation. Members of the Logiso Table Tennis Association, they are from Ladysmith in the KwaZulu-Natal province. They were introduced to the sport of table tennis by their elder sister, Thulile Shabangu, a former member of the South African national team. Later, Mthabiseng was selected for the 2016 World Junior Championships in Cape Town; her presence in Mauritius is her first senior outing with the team. Somewhat differently, Thabisile is more experienced. She was included in the South African Team at the 2014 World Team Championship in Tokyo, Japan. She secured her place in the squad for Mauritius following success at recent trials. Throughout their fledgling careers, both have received outstanding support from their parents. Meaningful activities and most meaningful; the say there is a pot of gold at the end of the rainbow; in Port Louis for the young ladies from the Rainbow nation, there was no gold but a bronze medal was a most worthy achievement.